I was at a car boot fair wandering around and came across a stall selling tools. In a small tray there were a few milling cutters and one of them was this distinctive cutter – brand new and only £2…. This cutter has a very distinctive treatment at the cutting end of the mill. This cutter goes through mild steel like butter. 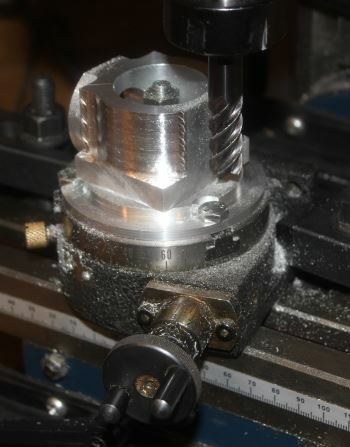 This shows the end mill being used to machine an aluminium crankcase. The outer surface is being profiled with the end mill and a rotary table. The depth of cut is greater than the depth of cut available for this end mill and so the machining is being done in stages. I ran the end mill at around 1500rpm and once again it cut through the aluminium without any trouble and this meant that the loads on the milling machine were very low. I cannot tell you much about this end mill in terms of cost, type etc other than to say it works brilliantly. If anybody knows more about this then please email me and I will add to the review. 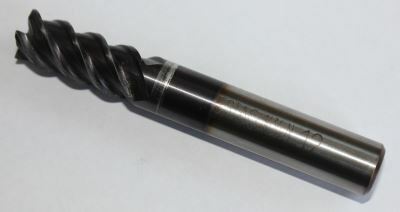 Price: approx £2.00 (car boot) for a 12mm end mill.